Only one weak link in another solid SAFC performance - Ethan's awaydays & player ratings! 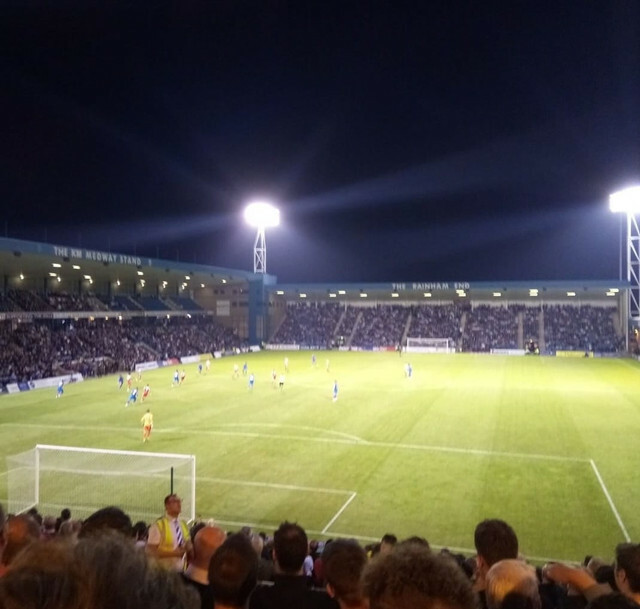 Priestfield Stadium is only a five minute walk from the train station and where the buses were parked. However, most Wearsiders went to the chippy up the road which, I'm told, sold decent kebabs; the majority then went onto pubs which were lined up a road another five minutes from the ground. The pub I went in was called the Fluer de Lin where most away fans had gathered outside on the pavement to enjoy the southern sun. The away end was down a narrow, residential street and fans were greeted by the sight a stand constructed out of scaffolding. A bit different to the Emirates and the Etihad. The first goal was scored by Tom Eaves after Jon McLaughlin came for a cross he failed to collect, although Sunderland's number one may have been impeded. I must be honest and say I didn't see their goal as I was walking up to my seat at the back of the makeshift stand! But that was no worry as I arrived in time for the near immediate response from Chris Maguire who nodded home from a Lee Cattermole flick on. That was after Max Power delivered a decent corner. Captain George Honeyman then put the Mackems in front after some good play down the right before Josh Maja held the ball up well in the 18 yard area, the academy product laid it off for Honeyman to smash home past the Gillingham keeper. The third came courtesy of Power, Maja won possession just inside the opposition half before playing Lynden Gooch down the right hand side. The Californian rolled it to Power, who was arriving on the edge of the area, and he precisely placed a shot into the bottom corner to double the visitors' lead. A great counter attacking move, capped off with a super finish. I certainly wasn't accustomed to seeing three Sunderland goals in a first half but it seems I'd better get used to it as it's two games running now! The first chance of the second half came for the home side after Donald Love made a mistake by letting the ball bounce - something he had done all night. McLaughlin made a good, reflex save to deny Gillingham before Jack Baldwin cleared into the stands. Sunderland then added a fourth through Maja. After a poor cross by the determined Reece James, Gillingham failed to clear and Maja gobbled up the chance to be the first Sunderland player to score in four consecutive games at the start of a season since David Halliday in 1927. The last person to score three consecutive opening league games was Kevin Phillips! McLaughlin came to the rescue again when Baldwin had made a hash of a clearance, however the former Hartlepool man reconciled himself by chucking himself at the ball to make sure the Gills didn't get a consolation. We didn't play fantastic but that just shows that we're a good side if we can play average and still batter teams. Maguire looks a fantastic player at this level and an absolute steal. Baldwin and Loovens look like a solid central defensive partnership and James looked decent in both defending and attacking, however he is not quite Bryan Oviedo. Donald Love looked like the only weak link in that side but probably won't get a look in if the Welshman Matthews is fit. McGeouch didn't really have to do much but at least he's getting game time and, of course, we need to make sure we don't rush him back. Maja looks like an experienced striker already, he's certainly proved me wrong as I said he wouldn't be able to be a consistent and clinical goalscorer, although we have only played 5 games! Still great to think we have Charlie Wyke to come back from injury too. McLaughlin: 8 - made two fantastic saves but could've done better for the goal, although may've been blocked. Love (Hume '78): 5 - weak link in the team, let the ball bounce too often . Baldwin: 8 - looked like a rock again despite his mistake which he made up for. Loovens: 8 - again another great performance and commanded the defence well. James: 8 - looked good going forward, maybe missing that final ball. Power (O'Nien '83): 9 - was fantastic as ever and could be a contender for POTS if he keeps it up - plus his Instagram stories with Donald Love are quality! Oh aye and a superb finish. Honeyman: 7 - decent finish and played alright. Cattermole: 6 - didn't do much but didn't do much wrong either. Gooch: 7 - worked hard and played fantastic down the wings. Maja: 9 - held the ball up decent and finished well when it dropped to him. McGeouch: 5 - didn't do much when he came on but only had 20 minutes and not fully fit. Thanks for reading and lets continue our unbeaten start down Kingsmeadow. Share your thoughts on Twitter with @ethan_thoburn or @WeAreWearside.